Tickets for the express service to Arima Onsen can be purchased up to one moth in advance. Please make your purchase from the website detailed below, Japan Bus Online (available only in English). On the day of travel, please prepare the boarding pass sent to your mobile phone email account, and arrive at the platform no less than 10 minutes prior to departure. The bus will leave at the scheduled time even if all holders of pre-purchased tickets are not present. Please be advised that passengers who miss their bus will not be offered a refund. Boarding information will begin to be announced approximately 10 minutes prior to the scheduled departure time. Please proceed to the boarding area as far in advance as possible. Passengers are permitted one carry-on bag per person. Please place large bags in the luggage bay. However, as space in the luggage bay is limited, some medium-sized or larger items such as suitcases, skis, etc., may not be able to be accommodated. Additionally, passengers should carry any valuables, perishable foods, or precision instruments such as computers with them aboard the bus. Tickets will be verified by a bus crew member upon boarding. As these will then be collected when exiting the bus, passengers should take care not to lose their tickets. When boarding the bus, please present the boarding pass sent to your mobile phone email account to the bus crew member. 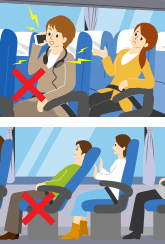 Once aboard, please sit in your designated seat and observe all rules and regulations of passenger conduct (see https://japanbusonline.com/Etiquette). Each passenger who purchases a ticket using our reserved seating system has a designated seat. Passengers should confirm their seat numbers prior to seating themselves. Also, as placing luggage in the aisle obstructs the passage of other riders, please store carry-on items on the overhead baggage racks. Wearing a seat belt when seated is required by law. For passenger safety, we request that riders keep their seat belts fastened at all times while the vehicle is moving. Please set mobile phones to silent mode, and refrain from talking on mobile phones, while aboard the bus. Regarding the use of mobile phones for email, etc., we request that passengers demonstrate courtesy so as not to trouble surrounding riders, such as by turning off operation ringtones, incoming message ringtones, and so forth. We request similar courtesy when using music players, portable televisions, portable video game consoles, and other such devices. Passengers who wish to recline in their seats are asked to be mindful of those behind them. *This Hankyu Bus operates on a set schedule and set route. Please check the display shown on the side of the vehicle to confirm that you have the correct bus prior to boarding. Copyright © 2017 HANKYU Bus Co.,Ltd. All rights reserved.